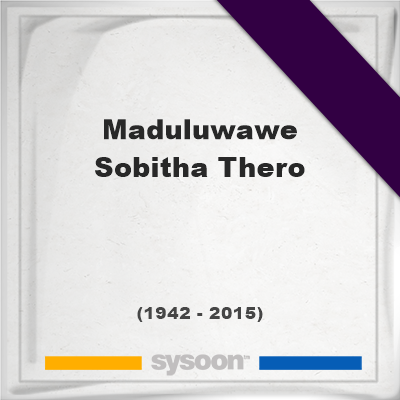 This memorial website was created in memory of our loved one, Maduluwawe Sobitha Thero, 73, born on May 29, 1942 and passed away on November 8, 2015. Where Maduluwawe Sobitha Thero is buried? Locate the grave of Maduluwawe Sobitha Thero. How Maduluwawe Sobitha Thero died? How to find family and friends of Maduluwawe Sobitha Thero? What can I do for Maduluwawe Sobitha Thero? was a Sinhalese Buddhist Bikku. A prominent socialist, social justice activist who led campaigns that toppled governments in several times and a Buddhist style non violent revolutionary. He was the chief incumbent of the Kotte Naga Vihara. The Thero played a key role to bring a new government in 2015 defeating Mahinda Rajapaksa. He supported common candidate Maithripala Sirisena for presidency, and Ranil Wickremesinghe to form a new government. Ven Sobitha died on 8th November 2015 at the Mount Elizabeth Hospital in Singapore. He was 73. Ven. Sobitha Thero became a Buddhist temple life at the age of 13. He never belong to any political party and led a influential political life with significant charisma. He had later told media that his initial inspiration came from 1956 socialist revolution that brought a reformist government to power against the pro western UNP led ruling elite. He comes in to prominence during his struggle against then President J R Jayewardene (in office: 1977-1988) and his effort to centralize power with the presidency, threats against freedom of expression, civil rights and rule of law. He was one of the most important leaders of the anti Indian intervention campaign in late 1980’s as well. He was an excellent orator in mobilizing the Sri Lankan populace across the spectrum. He put his charisma, influence and skill to maximum use in the flight through National Movement for a Just Society (NMJS) to bring pro rights government in 8th of January, 2015 that sent Mahinda Rajapakse home. He not only unified the divided opposition but also unified the trade unions, rights groups, Artistes, professional and academia alike in his cause. Note: Do you have a family photo of Maduluwawe Sobitha Thero? Consider uploading your photo of Maduluwawe Sobitha Thero so that your pictures are included in Maduluwawe Sobitha Thero's genealogy, family trees & family history records. Sysoon enables anyone to create a free online tribute for a much loved relative or friend who has passed away. Address and location of Maduluwawe Sobitha Thero which have been published. Click on the address to view a map. Maduluwawe Sobitha Thero was born in Sri Lanka. Maduluwawe Sobitha Thero died in Singapore.